We all want to feel safe when taking a shower or bath. 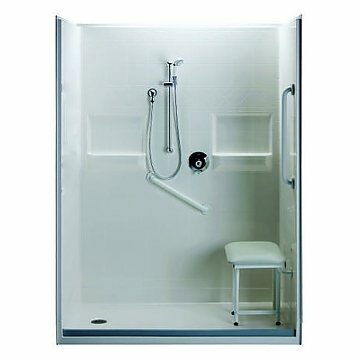 Our top quality roll in shower systems are specifically designed for the elderly and disabled. Bathers that have difficulty walking around or going up and down stairs will appreciate the simplicity of our walk in showers. They come with a designed in transfer bench which makes it possible for the bather to sit while they enjoy a nice shower. Our units can come with a hand held shower wand to make reaching the difficult places much easier. Our Best Bath Systems step in showers are made right here in the U.S.A. You can trust their years of expertise and leading the handicap accessibility bathing market. Get a roll in shower that is just your style. You can have the color and tile designed customized to your preferences. Roll in showers don’t have to be ordinary and plain. With Best Bath showers can match your decor and style. Low threshold showers are becoming more popular these days for seniors who are choosing to age in place verses going the route of assisted living. Some people just prefer to stay in their homes despite the obvious challenges. Fortunately their are home modifications you can make to make your home more aging in place friendly. Installing grab bars and a low threshold bathing appliance is a great step in making your home more accessible. No one expects to have a fall. A little planning can go a long way. it’s best to take precautions than wish you had. Please contact an Aging Safely representative today for a no obligation consultation. You want your roll in bathing system to perform and last a long time. Our industry leading 3o year warranty gives you full assurance the highest quality standards are being met. Not only can our handicapped showers last a long time, but they look really great too. With a modern appeal, your new shower will easily go with almost any style of home or décor. Walk in shower installers prefer working with our showers because they are multi-piece, have reinforced walls and the shower pan don’t require being wet set. It’s all ready to be assembled and installed right when it gets to your home or business. Roll in shower stalls can be a great investment for elderly people that are looking to stay in their homes longer and want to experience a sense of independence while bathing. For many people it can simply offer greater piece of mind, and act as an extra resource. If you prefer to look at one of our handicap bathtubs click here. Add a little style to your handicap shower. You can choose from several designer patterns, or even provide your own to have it built custom for you. Our walk in showers are stylish and by adding design patterns to the walls you can really get creative! It’s easier to match decor and style preferences when you can select from custom colors and design options. Our quality disability showers can also be coupled with designer grab bars. You can choose from a wide variety of unique grab bar shapes and colors. Please contact an Aging Safely Senior Representative today to get pricing.